Muay Thai Fight Nights… Is there any better entertainment possible for an evening?? While I’ve seen fight nights in Sangkhlaburi over the New Year, it wasn’t until I started training in Muay Thai Kickboxing that I really started to not only appreciate, but also notice so many more details of the action. 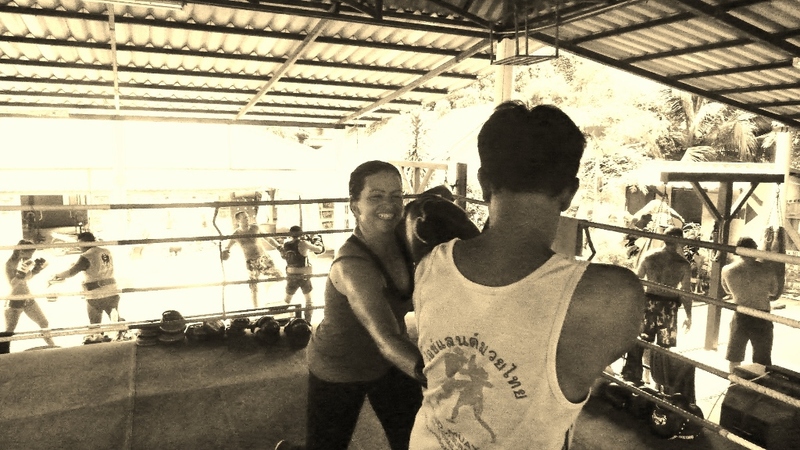 On the lovely island of Koh Tao, fight nights take place every 10 days at the Island Muay Thai training gym. And every 10 days I would stay up past my normal bed time of 10pm (hey, I was trying to stay healthy and get in shape so early to bed and early to rise was my schedule then! That was until Anna arrived… but that’s another post!) and join in the fun of the fights. Being a solo traveler does have its perks, as does training at the same facility where the fight nights are hosted, but in truth if the owner and trainers of Island Muay Thai weren’t as nice of souls as they are, I would never have had as much of a great time as I did in each of the 7 or so fight nights I’d been to since being on the island. Why do you ask? Ring side seating!! Sitting beside the owner (Patone) in his elevated judges chair literally right smack on the edge of the ring. The scent of deep heat oil was thick and awakened the senses, you could feel the sweat from the bodies fling your way as a punch or kick hit and ice was potentially flung your way during the round breaks as the assistants iced down the fighters. There were even a few times where the fighters pinned each other against the ring and were pressing so hard against it that it seemed they may fall into my lap if the ropes didn’t hold! All the action could clearly be seen and it just added another level of thrill to the sport! Of course I never expected to be able to sit ring side. But when I showed up for the first fight night and picked a spot in the top row of the bleachers sitting on my own I think the owner felt bad for me and invited me to sit with him, even offering to buy me a beer. And again though I figured it would only ever be a one-time thing, after about 3 times it seemed to just be the way it would be. It was a generous gesture and one I won’t soon forget for sure! I also wasn’t alone in being ring side as others were also invited for the up-close fun, but I was just tickled to have been one of them 🙂 Though admittedly I do wish sometimes I would forget watching the fighters spit and (sadly) shed blood over the ring surface knowing that the next day I would be sprawled on the very surface doing my cooldown stretches or sit-ups, lol!! Speaking of blood… Yes, Muay Thai is obviously a contact sport and there is always the chance for skin to be split apart and blood spilled. I’ve never seen fights in Bangkok, but I’ve heard that aside from featuring (no doubt)the best fighters and having to pay a pretty penny to see a show, that the fights are quite brutal in that blood is often shed due to them being “glove-off” fights and the fights aren’t near as often broken up by the ref. Here the fighters wear gloves and the ref often intervenes if it looks like an unfair hit (striking someone when they are on the floor) or stand-off (the fighters are locked into a hold where neither can really make a move) and skin breaking injuries only occur if an elbow has made contact. Surprisingly most of the fighters don’t even wear mouth guards! And while most fights I’ve seen result in the usual bruises, one fight night in particular resulted in a cracked tooth, 2 split shins, and 2 split skulls!! Ok, obviously the skulls weren’t cracked (I hope!) but at least the skin on their skulls were. Pictures as you can tell are quite a bit hard to take in great focus… Of course that depends on the camera AND the user… But honestly while many more could have been taken, I found that my focus was diverted from the fight while snapping away because I kept trying to get that “perfect shot” and I didn’t want to miss a potentially great knock-out! Sometimes the final fight would feature a falang (foreigner, i.e. non-Thai) fighter who had come to the island just to visit or continue training and they would be asked to fight in the upcoming event. Those fights honestly were not my favorite to watch because they seemed quite poorly matched. It always seemed the falangs were either really tall and ripped or just muscled to the hilt and they were up against a Thai fighter who looked at least 50 pounds (whether in weight or muscle) lighter and a foot shorter. Probably my favorite of the fights was one that was cleverly fought. It was against two Thai fighters and while one was getting in lots of punches and kicks, the other would either endure the hit or miss it by avoidance. Into the third round it looked like the one fighter was going to eventually get pummeled over but he kept avoiding hits just enough to stay active and in a single split second when the intimidating fighter let his guard down, the other fighter let out a swing kick right to his head and knocked him out. Ding, ding game over!! It took several minutes to wake up the knocked out fighter too! Overall, if ever in Koh Tao and looking for a fun night out, I highly recommend going to the Muay Thai fight night!! After stretching, several minutes of jumping rope, shadow boxing, 100 front kicks on the bag and my hands wrapped and gloved up it’s time for training. Before getting into it, I gotta admit a funny on my part. I would hear throughout the training that the trainers would say “ma” quite a bit. “Ma” in Thai has several meanings (dog, horse, come) and since I was most familiar with “ma” meaning “dog” from working at the animal shelter, I kept wondering why the trainers were calling us dogs, lol!! But then I recalled it also means “come” so that made more sense! Nope… 4 more rounds to go…. Part of the reason I wanted to stay for a month on the beautiful island of Koh Tao, Thailand was so I could dip my toes a bit in the world of Muay Thai Kickboxing. Though I’m not in perfect shape, I do really enjoy working out and try to get workouts in daily, even when traveling. As any fitness fanatic knows however, the best way to stay on top of your fitness is to mix up your workouts. 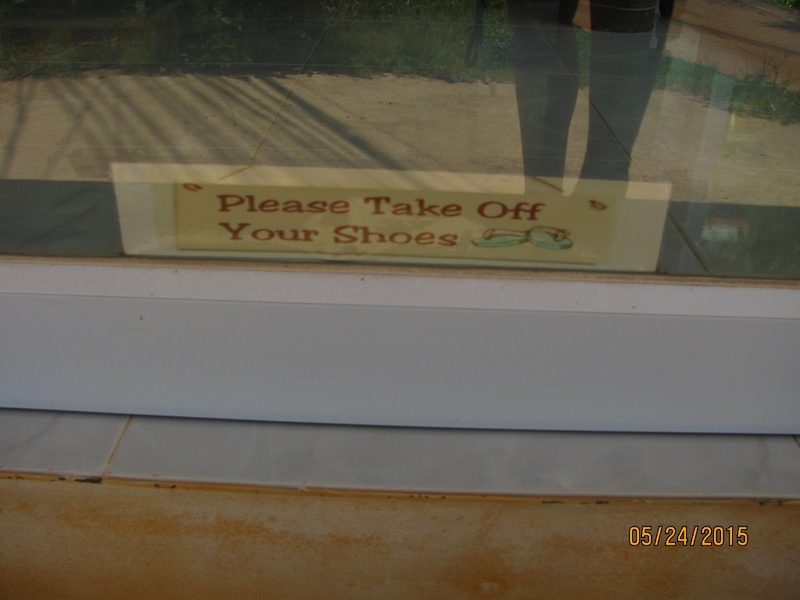 Since I’m in Thailand, I figured why not give their traditional martial art of Muay Thai a try? I did not originally come to Koh Tao expecting to stay so long. I had the idea that I would “if and only if” I found a Muay Thai gym I liked. On the island there are actually two gyms that offer Muay Thai training. Monsoon Gym and Island Muay Thai. I checked both places out, dropping by during their training hours just to get a vibe of each place prior to committing to either (if at all). Dropping by during training hours was purposeful because I wanted to get the sense of two things: first a sneak peek at the training and how the trainers interacted with students (my trainers test) and second to see how I would be greeted during a busy time (my management test). On the surface, my observations were as follows. While Monsoon Gym doesn’t have a ring, it has a very impressive workout and training space. The practice area looks brand new and their gym (to get in weight or extra cardio workouts) is also quite nice! In addition, they offered a variety of classes such as capoeira and crossfit type classes that you could mix in with the Muay Thai training. They even offered on-site dorms as accommodation (for an extra price of course) to those training with them. It was evident that a lot of money was put into the place. By comparison the Island Muay Thai training facility did have a ring but their training area looked rather used and broken in, so to speak. Their gym area to get in extra weight or cardio workouts really wasn’t anything to write home about as it had outdated machines and not a huge variety of weights. Whether the gym had a ring or not was not a concern or care to me as I had no intention to fight, only to train for fitness. So on the surface Monsoon gym had me hands down (especially since they offered more of a variety of fitness classes). However one huge difference between the two gyms led me to make my ultimate decision. They say first impressions are the most important. And as far as I’m concerned, they can make or break a person or business. Monsoon Gym, while impressive visually, fell flat on its face when I popped by to check the place out. It had the feel of where the cool kids and cliques hung out. I stood around for about 10 minutes waiting to get the eye of someone (anyone) who worked there to ask questions about the courses. Of course there were posters everywhere giving pricing information and such, and while I technically got all the info I needed just by looking at the posters, my point in going in personally was to get the feel of the place and people. And based on that aspect, I was not impressed. I finally struck a conversation with a random person hanging about who had been training there and talked to him about the place. He was actually very nice and informative and had nothing but praise for the place. But when he pointed me in the direction of one of the people who worked there (a falang whose exact role I can’t recall) and I went to chat with her, the welcoming was icy and indifferent. I should mention however that based on my observations of the trainers themselves, I had no negative impression as they seemed very engaged with the students. On the contrast was my impression of Island Muay Thai. Again I showed up during training hours and was immediately greeted by someone (who turned out was the owner) with a flyer listing prices and giving information. And again, while visually the place was lack-luster compared to Monsoon, it felt more serious and more focused. It had that wholesome “come as you are and let us kick your rear with a killer workout” feel that inspires me to work hard. Also the vibe felt comforting and made me feel confident to simply show up as I was (even with several extra pounds to lose!) and not feel embarrassed that I wasn’t in perfect shape. And to boot I was actually acknowledged as I came up to the place! To me, the vibes between the gyms were night and day and I very happily (after finding a place to stay) signed up with Island Muay Thai for a month. For the past month now, I’ve been going to Island Muay Thai about 4 times a week. Between working out there and going there for the fight nights (every 10 days!!) it’s practically become a second home to me, lol! I arrive a little before 8am to get in about 5-10 minutes of stretching, then hit the jump ropes for anywhere between 5-10 minutes, then it’s time to get the hands wrapped and the gloves on for training. Depending on the trainer, the sessions can go in a variety of directions: 3 minutes on, 1 minute break or up to 10 minutes on and several minute breaks. Either way the end result is always the same: I leave exhausted, super sweaty and ready for a cold shower!! What I appreciate most is each trainer has their own focus, or specific set of things that they watch out for, or area of expertise. What that boils down to is that I learn something new each and every time. And each criticism from the various trainers compliment each other too. So learning one specific stance or technique from one trainer compliments what you’ve been taught by another and so on. I’ve injured myself a bit here and there (blisters, bruises, and feeling like my feet were broken) along the way due to my being exhausted and using improper technique, but I love the training! They push me to work harder each time and the training is unlike else I’ve done so far. I sweat buckets during each workout and sometimes feel like I could either pass out (because I’m holding my breath during the punches or kicks) or vomit by the end, but I still show up and am even staying for yet another month so I can train on 🙂 This time it will be 5 days a week just to see how much more fit I can get with it. Let the games begin!! I’ve noticed recently that I’ve been practicing what I’ve now coined as the “smack first, ask questions later” action… It really has nothing to do with the recent Muay Thai training I’ve been doing (just finished session 5 today and it’s a real rear-kicker!!). And when I think back I’ve been “smacking first and asking later” since arriving in Thailand last December. So what am I referring to exactly? Well, you see, not every place has a mosquito net covering the beds. And even if they did, they don’t prevent 100% of whatever night critters decide to come out and join you bedside… And since I’m arachnophobic, I would rather not actually see what it is that’s crawling on me, because if I ever visually found it to be a spider I would absolutely lose my mind. Enter the “smack first, ask questions later” motto. It’s a simple concept that I use more often than not. Whenever I feel something on my skin while in bed or hanging about, without looking to see what it is, I simply smack the area where I feel the unknown critter. Sometimes that’s the end of it. But sometimes I do feel a body beneath my hand in the area I’ve just smacked so just as quickly as I’ve hit the unknown creature I swiftly grab the body and chuck it as far away as possible from where I am. It’s become such a common movement that I don’t even notice I’ve done it sometimes. 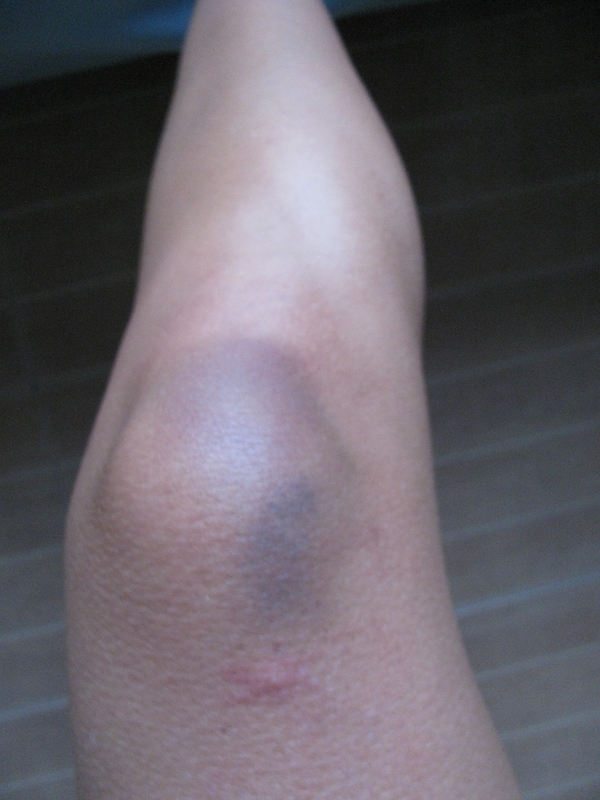 And yet I wonder where that bruise came from the next day, lol! !